One of the profoundest hurdles for students of mathematics is learning to think of a given mathematical symbol in a variety of ways. The variable X may be thought of as a "constant" which may be "specified" or "unspecified", and which may "vary" or be "fixed", and may be "independent" of other variables or "dependent" on them. What is a variable? Difference between symbol and value. The options which our minds have for interpreting a variable may be dictated by a cognitive structure. We collected a variety of terms which characterize variables. Indeed, we found 12 pairs such as "known" and "unknown", "free" and "bound" or "input" and "output". Such pairs indicate how a variable may be reinterpreted. Semiotically, a variable is a sign. What can we say about what different kinds of variables signify? A logical or mathematical expression contains variables from some alphabet A, B, C... If these variables are "free" or "unknown" then they refer to nothing more and we may think of them as uninterpreted. But if they are "bound" or "arbitrary" or "independent" then we imagine them indicating a range of possibilities. If they are "known" or "particular" or even "unspecified" then they refer to particular possibilities, which we ourselves may not yet know, however. And if they are "specified" or "dependent" or "values" then they are explicitly related to other variables so that we may say that we ourselves do know them. 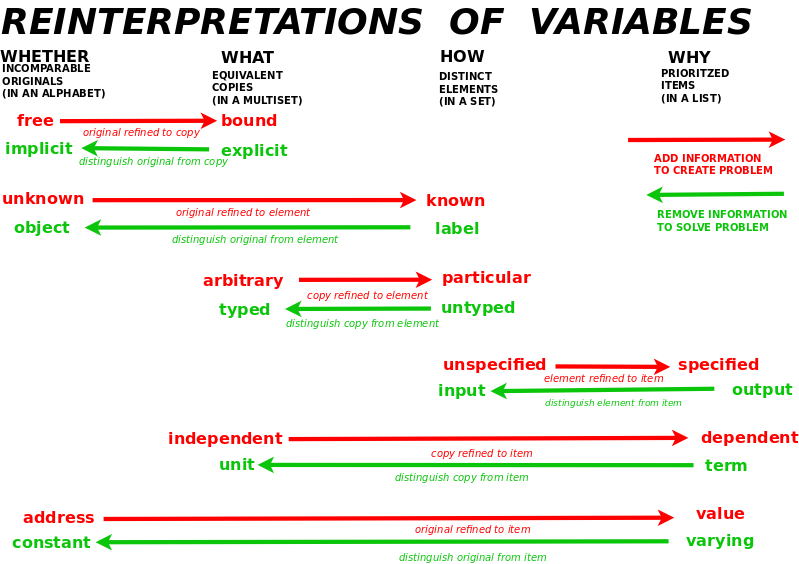 In summary, we may think of variables as refering to unrelated originals (in an alphabet), interchangeable copies (in a multiset), particular elements (in a set) or prioritized items (in a list). They manifest a recurrent cognitive framework of levels of knowledge: whether, what, how and why. Each pair of terms refers to two such levels. Structurally, we find six pairs which our minds use to enrich the content of a variable, for example, to reinterpret a free variable as a bound variable, in order to define a problem by adding information. We also find six pairs which our minds use to emphasize the form of a variable, for example, to reinterpret an output as an input, in order to solve a problem by removing information. The way that our minds recast variables to create and solve problems is meaningful in exploring the cognitive foundations of logic.